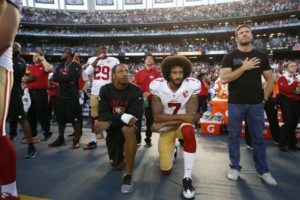 Colin Kaepernick seems to be shocking the world again after this year’s controversy of him not standing during the national anthem. The reactions across the nation has been mixed. Yet one side is upset because they believe that he disrespected the US flag and veterans. Then you have one side that feels that Colin Kaepernick is a hero for exercising his first amendment rights by protesting the injustices that millions of minorities go through on a daily basis. Colin Kaepernick stated that his protest was “ultimately to bring awareness and make people know what’s really going on in this country. Their are lot of things that are going on in this country that are unjust, people are not being held accountable and there are something that needs to change”. That explanation didn’t quite go over so well with some people and did not stop the racial slurs from coming. The racial tensions that this caused actually is what helped benefit his cause and his beliefs. According to ESPN Colin Kaepernick is in high demand. According to Darren Rovell “ Colin Kaepernick is now the 49ers best selling jersey. More of his gear sold in last week on the 49ers site than the past 8 months combined”. Darren Rovell also went on Twitter and stated that “Colin Kaepernick and his jersey is now the second most popular sold on NFL.com, surpassing Odel Beckham Jr and behind Ezekiel”. This is kind of ironic that the protesters who are protesting against Colin Kaepernick are actually helping his cause. 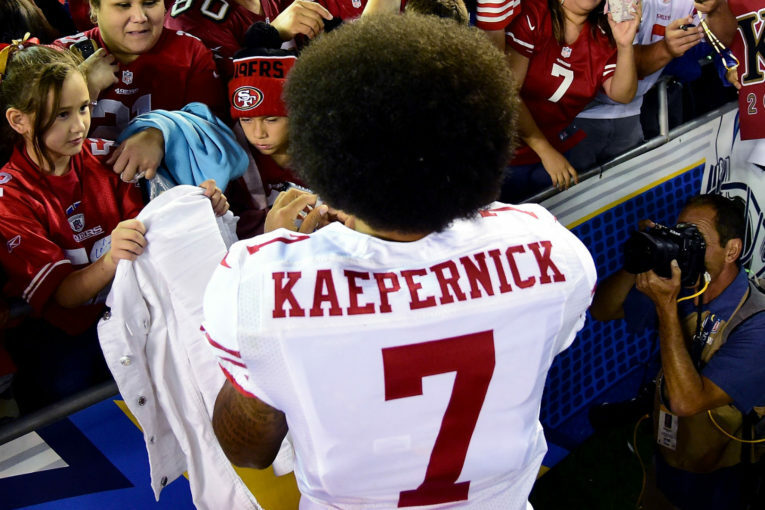 Colin Kaepernick is reportedly donating all of the monies made from his jersey sales to nonprofits. It looks like something good is actually starting to come out of him not standing.